As a family blogger we often receive many opportunities to attend new exhibits, or preview new attractions. 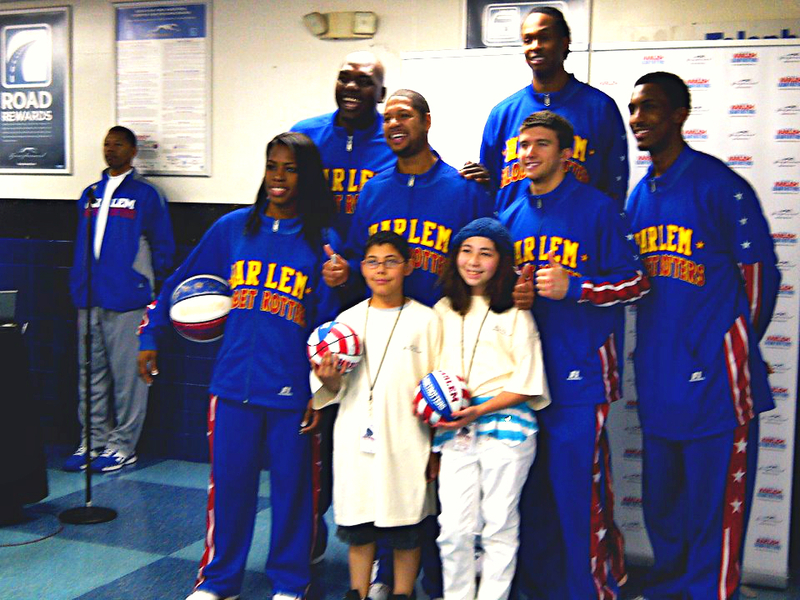 Last year we had the wonderful opportunity to meet face the face the incredibly talented Harlem Globetrotters. This was a dream come true for my kids, who have been a "Globie" fan for as long as I can remember. S.P.I.N.™ - Some Playtime Is Necessary – a program designed to make fitness fun for kids, while promoting and encouraging an active lifestyle. C.H.E.E.R.™ - The program targets 6-12 year-old students and involves Globetrotter players incorporating their signature ball handling skills with a “C.H.E.E.R.”™ basketball. The basketball includes each of the character traits printed on the outside of the ball and is used as a key tool during the presentation to each school. Globetrotter players encourage students to match their actions with those five character traits in all their life experiences with parents, teachers and one another. SMILE PATROL™ -The Harlem Globetrotters Smile Patrol™ is the proprietary hospital community outreach program designed to brighten the day and lift the spirits of some very special fans unable to attend a Globetrotters game. The ABCs of Bullying Prevention - Known worldwide as the "Ambassadors of Goodwill"™, the iconic Harlem Globetrotters are debuting a new community outreach program, "The ABCs of Bullying Prevention," in an effort to impact schools and communities around the world. The Globetrotters designed the program in coordination with the National Campaign to Stop Violence (NCSV). The program focuses on Action, Bravery, and Compassion, comprising the ABCs. The Harlem Globetrotters love seeing families laugh together during their games, and would love to see your family when they come to a city near you. If you're looking for an awesome event the whole family will enjoy, get your tickets to the Harlem Globetrotters "You Write the Rules" tour. Your family's smiles will start before you even get to the game because this year, your family can vote at harlemglobetrotters.com, and decide rules for the game like two balls in play at the same time that could affect the final outcome. After the game, Globetrotters will stay on court to sign autographs and take photographs with your kids. The only thing better than finding an event the whole family will enjoy, is getting a great deal on it. Save $7 per ticket* by using the promo code "TOGETHER". Disclosure: I'm part of the Harlem Globetrotters Affiliate Program, and in exchange for my time and efforts in sharing this event and discount offer with you I have been provided with complimentary tickets. Opinion are 100% my own. Thank you for sharing such a helpful post with us.